Three weeks on from his bizarre actions at the U.S. Open, Phil Mickelson found himself at the centre of another highly unusual rules controversy on Sunday. Mickelson came in for significant criticism during the year's second major when he chose to putt a moving ball, seemingly in protest at the speed of the greens at Shinnecock Hills, and earned a two-shot penalty. On Sunday, the five-time major champion called a two-shot penalty on himself in the final round of A Military Tribute at the Greenbrier, after he had strangely chosen to pat down rough in front of the tee box before hitting his first shot on the seventh hole. Mickelson quickly realised he may have made a costly mistake, turning to playing partner Lanto Griffin and stating: "I'm not sure what I did then is legal." The 48-year-old duly explained the situation to a rules official, who confirmed Mickelson had violated Rule 13-2 by "improving his line of play". You can see how the strange drama unfolded here. 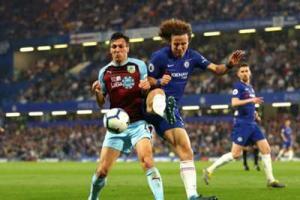 Burnley left Chelsea with a 2-2 draw on Sunday, but David Luiz was not impressed by their antics.